Dorian is a vampire who doesn’t believe in love. Haley is a mortal who doesn’t believe in vampires. At seventeen, Haley Scott’s life is pretty miserable. She lives with her uncle in a small town where she has absolutely no friends and barely any social life. Haley knows for a fact that there are very few people on the planet who care if she lives or dies. Dorian Vanderlind is a vampire with a past he’s reluctant to face. He visits his cousin as a favor, only to find himself entangled in the enticements of the mortal world. What happens when these two are thrown together in the most complicated of circumstances? 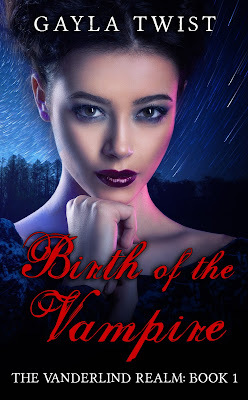 Find out in Birth of the Vampire ~ Book 1 in The Vanderlind Realm.